But Sir Keir said the government was not "countenancing any change" on the wording of the existing plan. A Downing Street spokesman said: "We have made serious proposals." The government was "prepared to pursue changes to the political declaration", a plan for the future relationship with the EU, to "deliver a deal that is acceptable to both sides", the spokesman said. 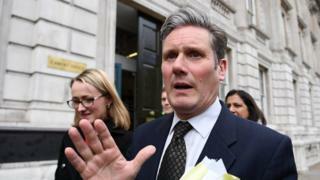 Sir Keir said the government's approach was "disappointing", and it would not consider any changes to the "actual wording" of the political declaration. "Compromise requires change," he said. "We want the talks to continue and we've written in those terms to the government, but we do need change if we're going to compromise." Both sides say they are serious about these talks, but there is little to show for that so far. After more than two years of negotiations with the EU and months of wrangling in parliament, the idea that the government could sit down with Labour and thrash out a deal that keeps both sides happy in a few days seems optimistic at best. There appears to be disagreement over what the talks can achieve; changes to the political declaration on the UK's future relationship with the EU, or an additional document to what has already been agreed? If a deal is done, it may or may not fly. Plenty of Tory MPs are uneasy about working with Labour and the closer ties to the EU it may lead to. Many Labour MPs want a further referendum regardless of what is agreed - something Jeremy Corbyn has been luke warm on so far. At this stage a deal looks doubtful. But this is Brexit and stranger things have happened. Prisons minister Rory Stewart told BBC Radio 4's PM programme that there were "tensions" but there was "quite a lot of life" left in the talks with Labour. "In truth the positions of the two parties are very, very close and where there's goodwill it should be possible to get this done and get it done relatively quickly," he said. He insisted that "of course we are prepared to compromise" on the political declaration. BBC political editor Laura Kuenssberg said: "The sense is that the government has only offered clarifications on what might be possible from the existing documents, rather than adjusting any of their actual proposals in the two documents." In case no agreement has been reached by 23 May, the prime minister has said the UK would prepare to field candidates in European parliamentary elections. BBC Europe editor Katya Adler has been told by a senior EU source that European Council President Donald Tusk will propose a 12-month "flexible" extension to Brexit, with the option of cutting it short if the UK Parliament ratifies a deal. But French President Emmanuel Macron's office said on Friday that it was "premature" to consider another delay.